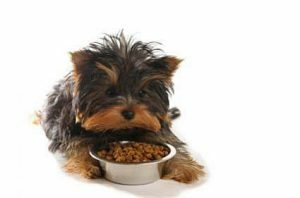 Why worry if your Morkie is overweight? Your Morkie is half Yorkie and half Maltese, and both of these breeds (and all pure breeds) have hereditary diseases that they MIGHT suffer from in their lifetime – it doesn’t mean they WILL get these diseases but they are more likely to than other breeds. A number of specific hereditary diseases that your Morkie could get, are made much worse by too much weight. Yorkshire Terriers, and to a lesser degree, Maltese, have a potential hereditary defect called Patellar Luxation – or “floating” kneecaps. The kneecap or patella, actually slips in and out of place. This disease is a result of years of breeding to produce all the good things we love about the Yorkie. Unfortunately along the way, some of the negatives stick too. You can imagine that extra weight on that leg aggravates the problem. Maltese dogs are more susceptible to Cushing’s Disease than many other breeds. This is another hereditary condition and it happens when the normal hormonal feedback loop goes crazy. Too much cortisone is produced by the adrenal glands. It’s more common in older dogs, and can even seem like the aging process itself, because the dog will gain weight, lose hair and pee in the house. Controlling weight of a dog with Cushing’s is more challenging, but it can be done. Your Vet will probably prescribe on-going medication to treat the disease, and can give you advice on managing your Morkie’s weight at the same time. Wondering “how big will my puppy get?” Click here.